Prague, easily one of the most beautiful cities in Europe. 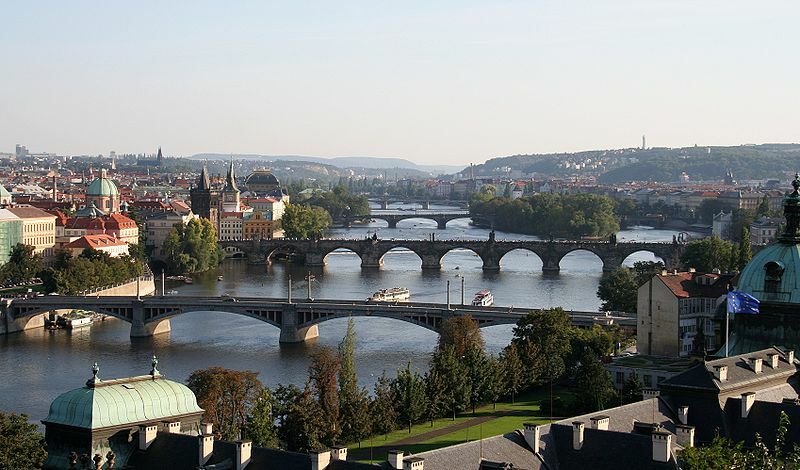 Dating back over 1,000 years, Prague effortlessly blends the modern with the historic. The architecture is stunning, offering winding cobblestoned streets and graceful buildings. The historic core is listed on the UNESCO World Cultural and Natural Heritage Register. The Old Town Square has been the city's principal public centre since the 10th century. The most popular tower in the square is the one that houses the Town Hall's Clock, known as the Astronomical Clock. Between the hours of 9am and 9pm, on the hour the 600 year old clock 'performs' with Death ringing a bell and the Apostles appearing above. Vanity, a miser, a Turk and a cockerel also make an appearance. The Castle is an ancient symbol of Czech lands and was founded around 880CE by Prince Borivoj. The Castle itself is like a small town, and according to the Guinness Book of World Records it is the largest coherent castle complex in the world. It is now the seat of the Czech President. Within the complex can be found St. Vitus Cathedral, the Old Royal Palace and Golden Lane. Golden Lane is a street, now shops, of quaint, smaller than average houses that once served as housing for the palace guards. Franz Kafka, the author, lived at no.22. 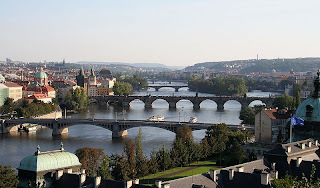 The 13th century Charles Bridge (Karlův most) which crosses the Vlatava River is usually packed with tourists and Czechs alike, especially during the spring and summer months. This ‘solid-land’ connection made Prague important as a trade route between east and west Europe. 75 statues adorn the bridge and perhaps the most interesting is that of John Nepomuk (eighth from the right as you cross towards the castle). Legend says that if you rub the bronze plaque at the base of the statue, you will be sure to return one day to Prague. The twin towers of this Gothic church rise up behind smaller buildings in the Old Town Square. At night, when lit up, it resembles a fairy tale castle. The church was built in the 14th century and was the primary place of worship for foreign merchants visiting the city. The church has a massive association with the Hussite cause and many pieces of history from this era can be found when visiting the church. TheChurch of St. Nicholas (Chrám sv. Mikuláše) was a Gothic building and was the parish church of the Old Town before the Tyn Church was built. It was taken by Benedictine monks during the Counter-Reformation of Czech lands during the 1600s and was then rebuilt in a Baroque style during the 1700s by Kilian Ignac Dienzenhofer. Ther church's interior is exquisitely decorated by Bernardo Spinetti and contains paintings by Petr Assamo which depict scenes from the life of St. Nicholas and St. Benedict. nly an 800m walk south from Kutná Hora’s main train station is the ossuary chapel. When the Schwarzenberg family purchased Sedleč monastery in 1870 they allowed a local woodcarver to get creative with the bones of at least 40,000 people that had been piled in the crypt for centuries. The result is spectacular – garlands of skulls and femurs are strung from the vaulted ceiling while in the centre dangles a vast chandelier containing at least one of each bone in the human body. Four giant pyramids of stacked bones sit in each corner of the chapel. A five star hotel, only five minutes from the Charles Bridge it is ideally situated for exploring the city. With music themed rooms and baroque gardens overlooking the city this is a luxury hotel worth the money. Double rooms start at €250 per night in low season. Simple rooms and traditional service can be expected in this boutique hotel. The Gray Sisters is an accommodating order that runs a tidy, all non-smoking hotel, without any unusual amenities, just a DVD lending library and WiFi but are warm, welcoming and traditional. Double rooms start at €100 per night in low season. For those on a tighter budget the Elite, located in the happening part of the Old Town is a good bet. The rooms are quirky and the staff friendly. Double rooms start at €45 per night in low season. Situated in the heart of the Old Town this restaurant offers traditional Czech food at prices that even the most tight budget can afford. Night or day, this is a bustling eatery with long low tables and the place to mix with the locals. Tel: 0042 222 316 265. Restored to its 19th century glory the café attracts a bohemian crowd for its fresh bread, ham and coffee. A good selection of fine wines and top class service make this a popular haunt. A brewery in medieval times the beer is still perfectly served. Labyrinthine halls are filled with heavy chairs and wooden benches. Beer starts at €1 and pub food is also available and tasty. Ruzyně airport is a 20 minutes shuttle bus ride away from the city centre and the taxis are no longer a rip-off and can be hired for a reasonable 650Kč.British Airways, Easyjet and WixxAir are some of the airlines that fly in there. If coming from central Europe the train network is reasonable and effective. The international trains arrive at the station in the centre of the city. Prague’s transit system (www.dpp.cz/en) is a marvel with big, fast, clean and cheap Metro trains running on three lines and trams and night trams (those with numbers in the 50s) criss-crossing the city. Buy a ticket at the machine by any Metro entrance or from most Tabák shops for 32 Kč for 90 minutes and unlimited transfers. Or get a day pass for 110 Kč or a three-day one for 310 Kč. If you have the legs for it, the city is still best explored by foot, with the chance to dip down interesting looking alleys and streets.